The weather in New York this time around wasn't that great but I'm not complaining, to me NYC is great no matter what. So, in the 3rd day I was wearing my NEW Joe Fresh graphic coat, striped top and Supermuse leather hat (perfect for the windy weather). Red, black and white fusion is a classic one and I love wearing it! This one of my favorite looks Veronica! That jacket is amazing and the hat and bag couldn’t be more perfect accessories!!! Beautiful look! 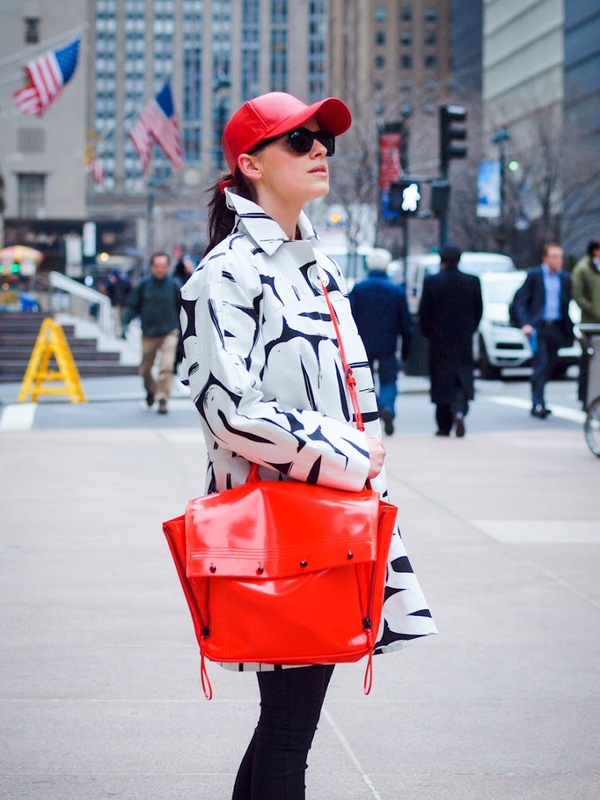 I love classy black and white combination with a pop of bright red! I totally love the outfit! that jacket: swoon!! looks like you had a great birthday trip! Beautiful cloak, and the image as a whole is very interesting! I love the bold print of your jacket and those awesome accessories.